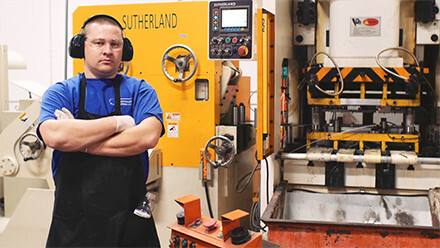 At Sutherland Presses, we believe that metal forming machines are only as good as the people who operate and manage them. That’s why we’re committed to providing our clients, distributors, and service providers with an ongoing series of educational events, both in-person and online. These events, trainings, and webinars are designed to offer the best, most up-to-date technical knowledge and best practices for Sutherland machines. New training events coming soon! Follow our News page for upcoming events, or contact a Sutherland representative to schedule a custom training event for your team. In addition to our in-house educational offerings, we are able to partner with clients and distributors to create customized on-site seminars, trainings, or webinars to meet your unique needs.